The more I listen to SubKonsious and his Deadsoundz crew, the more I'm convinced that this guy has bars for days. I'm yet to hear him freestyle but he effortlessly pulls out set-ups of hyping himself up and spits them with such conviction, it is hard not to appreciate the passion on show. This is a two edged sword of course. My main criticism of Deadsoundz' Initation EP (which is otherwise great, check my review here: http://bit.ly/11yZoW4), was the lack of lyrical bite. I felt that the majority of the MCs in the group tended to rely on filler as a crutch too often. 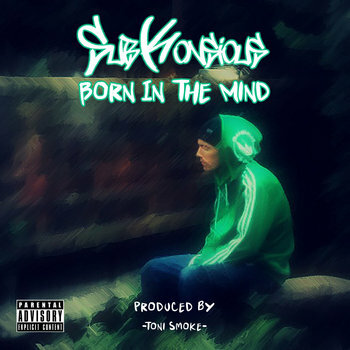 On Born in the Mind, this again crops up regularly towards the latter tracks, with allusions to fake MCs, skill with syllabics, his dope flow etc. making up too much of the actual content. These declarations from SubKonsious are well backed up of course - he's possibly the most natural at rapping aggressively in the Deadsoundz group, or a "motherfucking monster" as he puts it. Production-wise, Toni Smoke is attributed on the cover, and his beats generally seem to compliment SubKonsious' style quite well. I'm not a huge fan of the sampling of older tracks - The Doors and Johnny Cash are both used here (there could be more) - but on the whole they're generally more cohesive than the Deadsoundz EP, with 90s East Coast production a key influence. Oh, and 'Monster' is a monster of a track all round. But overall, the best tracks are the first four, particularly 'Glasgow State of Mind', which is a concept that makes sense and not only best showcases Sub's technical ability, but also hints at a penchant for writing out of a concept when the mood takes him. These opening tracks also establish the idea of retrospective that this album establishes. SubKonsious doesn't go as deep into the psyche as the title might suggest but he does have a gift for storytelling that I think he could develop considering he's pretty new to the game.